It's good to hear from you. I'm also glad you finally found the US Hawks! I happen to be US Hawks member #2 (Bob K being #1). I like to refer to my local club here as Socenny HGPA or just Socenny for short. I happen to be member #1 of Socenny and for local "political" reasons I'm one of the only members. In fact, I left the USHPA because Paul Voight refused to properly deal with two local chapters which were violating more than one of the USHPA's SOP's against me (for truly idiotic and petty reasons). Since nearly all the local pilots (some one time very good friends) want to remain "on the good side" of the two local chapters, they felt that associating with me would condemn them with one club or the other. I think the term "peer pressure" comes into play here. Anyway, I've been flying since 1975 and have flown in your area also*. Here in NY I've flown at Utsayantha, Ellenville (home site for 19 years), Harris Hill, Indian cliffs, Hammondsport and Mossy Bank. The last two are within about 5 miles of where I currently live. I've also flown from Bristol, Dansville, West Cameron (a site of my own) and the east side of Ellenville's Sawangunk ridge, aka the Gunks (one of about 6 pilots to have done so). I launched off of Bear Cliff once too. Locally, I've been seeing less and less hang gliding activity. Four years ago there were 20 - 30 active "local" HG pilots. Not sure where they've all gone since they stopped calling me and I have no interest in speaking with them. Had Paul Voight done his job, and straightened out the multiple SOP violations of the two local clubs, I'd bet that local HG activity would be at a higher level (at least I would have been working to make that happen - but no longer). I'll have to send you a PM with info on contacting me. My situation here foreshadowed the decline of the USHPA - very much like Bob K's long running situation at Torrey Pines. * Out on Cape Cod (N. Truro), Mt Ascutney, Morningside, . . . I also seem to remember flying at West Rutland and some other flying site in New England that was also a ski area (abt 1980?). It might be a good time to start a membership topic to keep track of your club members. You might also want to set up a minimalistic set of bylaws to get you started. Maybe you can apply to be a USHPA chapter as well as a US Hawks chapter. Also, as a fun fact, Scott took the bald eagle picture himself that's used as the club's logo. My home sites are Greylock and Mohawk. I do fly Rutland quite a bit . The cape is a winter option 3-4 x a year. I think I will drop USHPA next year. I'm trying to see what impact that will have on my flying. I know that there will be some impact but I think it's worth it. I responded to your PM. Lots of sites could operate under their state's recreational land use statues. Some sites (like Elleville) need to charge a fee in order to keep running and that negates the Rec Land Use laws. But what if the fee that is charged has to do with parking your car some place, or involves a "donation" to a certain party with a health issue? Such "income" can't be linked to paying to use some person's property in order to fly - so the recreational use laws could remain in effect. Locally, I presented a flying site land owner the NYS Recreational Land Use statute (back in 2012) and he had never even heard of it before that moment. 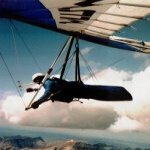 The NY law was placed on the books decades ago with hang gliding specifically added in the late 1970s or early 1980s. So why hadn't anyone shown it to him before? He doesn't charge anybody anything to fly from his land, so he's good to go! No USHPA site insurance required! Most sites in this area of NY involve the same set of circumstances. Who needs the USHPA and their (RRG) insurance if Rec Land Use laws hold the land owner harmless regarding liability issues? The answer is very likely - "Nobody". I forgot to say thanks for the stickers. I got mine back in ~ early September? They look great! I've been busy with all sorts of stuff and had forgotten all about receiving them. But every time I go out to the car I think, "There's that great US Hawks sticker! Dang, let Keith know you really like them!". I do appreciate the effort and cost put into making them up. We all do, I'm sure. I hope you've been getting some flying in. I got a bumper sticker! Yay!! !